Are there areas of your life where you felt like giving up on God because he hasn’t come through? Why do you think God is “slow” to fulfill his promises? What does it mean to be persistent with prayer? How does Jesus help us to continue to trust in God when we feel like giving up? Make a list of things you wanted, but never got. These are things that now as you look back you are thankful that God didn’t answer your prayer in the way you wanted. 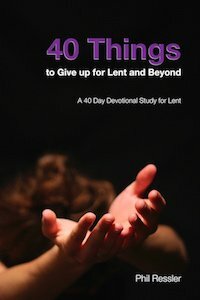 During Lent people practice fasting and deny themselves. One of the things about fasting is that we savor that first meal we partake after the fast. If you fast, think about how enjoyable that next meal is and how much better that meal is because you waited for it. God isn’t answering something in the way you expect. Start praying on it and start opening the Bible to see what God has to say about it. Today is opening day for baseball! I am a long-suffering fan of the Chicago Cubs. The Cubs are famous because they have not won a World Series in more than 100 years. I have often been tempted to give up on them. What keeps me going is that I believe this might be the year. They may never win, but I will never give up! But many of us are experiencing less than that full and abundant life. We have given up hoping for more and we have settled for something less. Maybe you prayed. It didn’t work. You went to church. It didn’t work. You did everything you could think of, but nothing changed. Rather than thriving, you have settled for surviving. The answer is not so much in us trying more, but in trusting. God keeps all his promises. Maybe not in the way or in the time we expect. There are many things that we don’t understand about God. We are told God’s ways are higher than our ways and his thoughts are greater than our thoughts (see Isaiah 55:9). We are also told that God is not slow in keeping his promises as some understand slowness (see 2 Peter 3:9). This is where trust comes in. Trust that everything will happen in God’s right time (see Galatians 4:4). Trust that he loves you. Trust that he knows what he is doing. Trust that he will respond at the right time. He is using this time grow your faith and confidence in him. He is using this time to bring you back to him and is waiting for you to call out to him. He is teaching you patience. He is waiting for you to repent of a persistent sin of which you are currently living unrepentant. He wants you to pray. He has something better in store that is beyond what you are expecting. He is opening a different door of opportunity that you don’t yet see because you are not looking for it. You are anticipating God to respond in the way that you expect so you are unable to perceive him responding in a different way. There is a step of faith you are not willing to take. Remember God is God. Those are a few of my thoughts, but my thoughts don’t compare to his. So don’t give up. Expect more. God is on the move and is able to do immeasurably more than you can imagine (Ephesians 3:20).